Background : Due to the controversy over efficacy of cognitive-behavioral therapy for chronic depression, recently, there has been an increasingly tendency toward therapeutic methods based on the cultural and spiritual approaches. The aim of this research was to compare efficacy of spiritual integrated psychotherapy (SIPT) and cognitive-behavioral therapy (CBT) on the intensity of depression symptoms and dysfunctional attitudes of patients with dysthymic disorder. Materials and Methods: This study had a mixed qualitative and quantitative design. In the first phase, SIPT model was prepared and, in the second phase, a double-blind random clinical trial was performed. Sixty-two patients with dysthymic disorder were selected from several centers include Nour and Alzahra Medical Center, Counseling Centers of Isfahan University of Medical Sciences and Goldis in Isfahan. The participants were randomly assigned to three experimental groups and one control group. The first group received 8 sessions treatment of SIPT, second groups also had 8 sessions of cognitive-behavioral therapy, which was specific to dysthymic disorder and third group were under antidepressant treatment. Beck depression inventory and dysfunctional attitudes scale were used to evaluate all the participants in four measurement stages. The data were analyzed using MANCOVA repeated measure method. Results : The results revealed that SIPT had more efficacy than medication based on both scales ( P < 0.01); however, it was not different from CBT. SIPT was more effective on the modification of dysfunctional attitudes compared with CBT and medication ( P < 0.05). Conclusion : These findings supported the efficacy of psychotherapy enriched with cultural capacities and religious teachings. Increasing studies of psychiatry, spirituality and religion deal with the necessity of mixing original religious teachings and cultural beliefs and convictions related to health in psychotherapeutic strategies. ,,, On this basis, different psychotherapeutic models have been created in different cultures by integrating psychotherapy and religious teachings. Some examples of these approaches include religious cognitive-behavioral therapy model for curing depression disorder,  spiritually focused therapy,  religious psychotherapist plan for depression and anxiety  and spiritually augmented cognitive behavioral therapy. Strengthening effectiveness of conventional psychotherapies with spiritual teaching is increasingly considered in eastern and Islamic countries. One can name mixed cultural-religious psychotherapy model for curing depression and anxiety. ,, Controlled clinical trials of efficacy and their better adequacy compared to similar non-religious therapies have been demonstrated for the Muslim population. Many systematic review studies have been conducted to study the point whether religious psychotherapy reduces depression and anxiety in patients with religious backgrounds and how consistent its effects can be. In this systematic review, random and semi-random controlled clinical studied were entered. The results showed that: Religious psychotherapy (RPT) was a reliable approach for psychotherapy and its effectiveness in the treatment of depression and anxiety was comparable to other therapies. Religious psychotherapy accelerated improvement of depression and anxiety symptoms and reduced psychological problems of psychosomatic patients. This model had more effectiveness in terms of reducing symptoms and preventing from the relapse of depression periods. , Nevertheless, some studies have shown that this psychotherapy model has not been different from other therapies during the 6 months follow-up stages. This clinical trial was conducted considering the current challenge in terms of the adequacy of cognitive-behavioral therapies for curing dysthymic patients and the necessity of strengthening psychotherapy with cultural and spiritual backgrounds on the one hand and the ambiguity in its stable effects and adequacy in different cultures. Thus, in order to answer these controversy, the aim of this study was to compare efficacy of spiritual (Islamic approach) integrated psychotherapy (SIPT) and cognitive-behavioral therapy (CBT) on the intensity of depression symptoms and dysfunctional attitudes of patients with dysthymic disorder. The research method was a mixed method design with two qualitative and quantitative phases. In the first phase and using the qualitative method model, grounded theory of spirituality integrated psychotherapy model was formulated. The second phase was a double-blind randomized clinical trial with a control group (waiting list). The participants (people with dysthymic disorder) were included in the study from different ways of requesting from general practitioners, psychiatrists, calling through notification in health centers (Noor and Alzahra Medical Centers), dormitories and faculties of Isfahan University of Medical Sciences and Isfahan Goldis Psychological Services Center. Initial screening was done through a clinical interview and structured clinical interview for DSM-IV Axis I Disorders (SCID-I). Positive cases who were qualified for entering the study were randomly assigned to one of the experimental conditions (experimental groups) or waiting list. The experimental and control groups were evaluated by Beck depression inventory (BDI-II) and dysfunctional attitude scale (DAS-26) in 4 sessions during the study (before the intervention, 4 weeks after starting, after ending the therapy and three months later). Inclusion criteria included dysthymic disorder diagnosis according to DSM-IV-TR, age between 20 and 65 years old, minimum literacy, no consumption of any psychiatrist medicine in the past 3 months and lack of participation in psychotherapy sessions in the past 6 months, Persian language, being Muslim and consent to the participation in this project. Exclusion criteria included suffering from one of the severe physical diseases, serious neurology, mental retardation, psychosis disorders or symptoms, bipolar disorder, depression disorders resulting from drug and alcohol abuse and other psychiatric disorders with depression as their secondary symptoms, reluctance of the patient to continue the therapy, serious suicide ideation and risk of suicide, which require emergency intervention. After performing the pretest by a doctor of clinical psychology, the intervention started by therapists. The raters and therapists were not aware of each others' work. The content and process of spirituality integrated psychotherapeutic intervention included theoretical model, intervention strategies and implementation guideline, which was extracted from religious (Islamic) sources in the first phase of the study and using grounded theory and was prepared in 8 sessions. This phase of the study lasted for 18 months. Based on the grounded theory,  the data paths were gathered and analyzed in different ways. First, religious and psychology experts were interviewed in Iran and their viewpoints were collected until data saturation, and followed by their analysis and conceptualization. In the next phase, religious sources including written and electronic sources were searched with regard to questions and goals and under the supervision of experts of religious sciences considering the interview data. Then the data were classified and analyzed in terms of content. Content of therapeutic protocol included religious theoretical viewpoint for explaining the formation of depression disorders and therapeutic methods including cognitive, behavioral, emotional-spiritual methods with religious content and behavioral recommendations in Islamic sources. Therefore, 8 weekly sessions of 45 min were held for each individual. Medication was prescribed by a psychiatrist and using standard medication protocol for patients suffering from dysthymia according to comprehensive textbook of psychiatry  and considering the medications available in Iran. Type of medicine, starting, continuing and ending dose were selected by and at discretion of the psychiatrist and suitable medicines were prescribed in a standard but flexible design depending on disease symptoms and conditions. The sheets for evaluating symptoms and prescribing medicines, which were completed by the psychiatrist were revised and confirmed by an assistant psychiatrist (professor of psychiatry) twice. Cognitive-behavioral therapeutic protocol which was used in this study was a standard copy of cognitive-behavioral therapeutic design for chronic depression and dysthymia, which was prepared by Moor and Garland. The mentioned therapeutic design was prepared in 8 weekly sessions. Each session lasted for 45 min and was held for each individual. SPSS-16 software was used for analysis and MANCOVA method with repeated measures was applied. Pretest scores of DAS-26 and BDI-II scales and age were controlled as covariate variables. Mean age of the participants in medication, cognitive-behavioral and religious cognitive-behavioral psychotherapy experiment groups and control group was 32.26 ± 10.36, 31.25 ± 8.82, 31.81 ± 10.31 and 29.06 ± 9.5, respectively. Fifty-five percent were female and 45% were male. Scores of depression and dysfunctional attitudes of the experiment and control groups were reported in four experimental phases in [Table 1]. Depression scores of groups were analyzed through MANCOVA with repeated measures. Before the analysis, the presumptions required for MANCOVA analysis were studied. Levin test confirmed homogeneity of variances (P > 0.05 and f = 0.94). M-Box test did not confirm homogeneity of co-variances but MANCOVA analysis was possible due to the equality of groups and application of Wilks' lambda conservative test. Pretest and the age scores were taken as covariate and their effect on the dependent variable was controlled. [Table 2] shows the results of MANCOVA analysis with repeated measures of the groups' depression scores in four experiment stages. [Table 2] shows the effect of treatment on the groups, depression scores in 4 stages (pretest, one month after starting, and the end of intervention and 3-month follow-up period). The findings indicated that therapy was effective in general (P < 0.0001) and time effect was also significant (the difference of different stages) (P < 0.01) and type of therapy had a significant relationship with measurement stages (time) (P < 0.01). Paired comparisons showed that all three therapeutic groups (medication, cognitive-behavioral and spirituality integrated psychotherapy) were significantly different from the control group (P < 0.01). Spirituality integrated psychotherapy group was significantly different from medication group ( P < 0.05); however, spirituality integrated psychotherapy group was not significantly different from cognitive-behavioral group. Also, cognitive-behavioral group was not significantly different from medication group ( P > 0.05). Another dependent variable of this study was dysfunctional attitudes. [Table 3] shows results of MANCOVA analysis with repeated measures for the scores of dysfunctional attitudes test (DAS-26). Equality assumption of the variance of DAS-26 scores was confirmed by Levin test in all four measurement stages ( P > 0.05). Equality assumption of covariance of dependent variable scores was not confirmed in four stages of measurement but it is possible to use this method later with regard to equal samples sizes and application of Wilks' lambda conservative test. Effects of pretest and age scores were controlled as covariate. MANCOVA analysis with repeated measures showed that therapeutic intervention effect was considerable on the reduction of DAS-26 scores ( P < 0.01), time effect (difference of different stages) was also significant ( P < 0.01) and the interaction between type of therapy and stages was also significant ( P < 0.001). Paired comparison of the mean of groups by post hoc tests showed that experiment groups except medication group were significantly different from the control group ( P < 0.05). Spirituality integrated psychotherapy group had more efficacy than medication and cognitive-behavioral group (P < 0.05) but there was not differences between cognitive-behavioral and medication group. [Figure 2] shows mean DAS-26 scores of groups in four experiment stages. As shown in the above figure, spirituality integrated psychotherapy group had a considerable effect on dysfunctional attitudes over time and medicine had no considerable effect on attitudes. The results showed that spirituality integrated psychotherapy had more efficacy on the reduction of depression symptoms among the patients suffering from dysthymia compared with the control and medication groups in post-test and follow-up stages (P < 0.05), but it was not significantly different from the cognitive-behavioral group. Also, spirituality integrated psychotherapy had more efficacy on the reduction of dysfunctional attitudes compared with the medication and cognitive-behavioral groups in post-test and follow-up stages (P < 0.05). Medication had no significant effect on the reduction of dysfunctional attitudes. Thus, it can be inferred that spirituality integrated psychotherapy, which was prepared as a qualitative study (grounded theory) can be effective in the reduction of depression symptoms and cognitive vulnerability of the patients suffering from dysthymia. The findings of this part of the research supported this viewpoint that different dimensions of religion play a major role in the treatment of hopelessness considering cognitive, behavioral, emotional and existentialism components  and spirituality based therapies, which concentrate on the components of control, meaning finding, identity and communication can strengthen the efficacy of therapy in terms of reducing depression symptoms, especially chronic depression, whether in combination with conventional psychotherapies or by themselves. On the other hand, findings of this research on the efficacy of sprituality integrated psychotherapy were not parallel with some findings of Azhar and Warma. 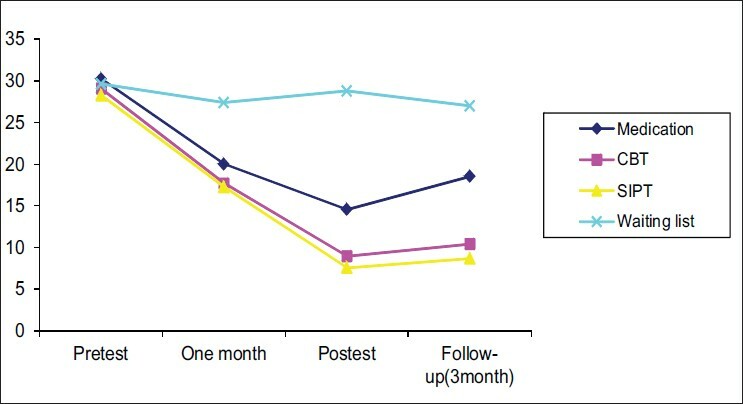 The groups did not have significant difference one month after starting the intervention and after ending the intervention but the effect of spiritually focused cognitive therapy was more consistent in the follow-up phase. Probably, lack of coordination between the mentioned findings and those of this research was resulted from the nature of this disorder (grief reaction in the mentioned study and dysthymic disorder in the present work). The findings of this research regarding the effectiveness of spirituality integrated psychotherapy supported Bartoli's approach  about the necessity of incorporating religious components in the intervention designs of dysthymic disorder. Another important finding of this study was the confirmation of CBT effectiveness in terms of the symptoms of the patients suffering from dysthymia. These findings were in line with broad meta-analysis results of Wampold et al. and Chen et al. with regard to CBT effectiveness on dysthymic disorders. The mentioned studies showed that effectiveness of CBT therapy was significantly different from that of the waiting list and pseudo-therapy conditions in all the stages. There was another similarity between this finding and meta-analysis results of National Health Institute, Research Cooperation Plan for Depression Therapy,  which showed the equal effect of medication and CBT. Another result of this clinical trial was the efficacy of medication on dysthymic symptoms. This part of the study was in line with the findings of Lima and Hatf,  which is one of the largest systematic reviews of medication therapy for dysthymic disorder. One of the similarities of this study to the studies which were entered into the mentioned review was the evaluation tool for determining medication effectiveness, which is usually SSRTs. Their general results demonstrated that antidepressants are adequate and effective for curing dysthymic disorder in comparison with placebos and the difference of different medicines is mostly found in their complication profile and loss of patients during the therapy. Adequacy evidence is stronger for SSRTs and TCAs group. In the present study, SSRTs were prescribed in more than 90% of the cases and the difference of this research from the findings of other studies was that the present work did not compare the complications of drugs. Confirming the efficacy of spirituality integrated psychotherapy and its probable preference over the consistency of the effect of therapy and correction of dysfunctional attitudes supports this model's theoretical bases and shows the coordination between theoretical framework and therapeutic solutions. It seems that performing cognitive, behavioral, ontological and spiritual strategies extracted from religious sources such as viewpoints of Imam Ali based on the creation of realistic attitude and adjustment of expectations with the current realities,  strategy of Imam Sadegh for creating and practicing a positive attitude toward future and searching for positive points in past experiences to change the present mood  and recommendations of Imam Bagher in terms of searching for meaning in hardship and positive and divine interpretation of incidents  along with the application of other believing-behavioral skills such as meditation, prayer and involvement with enjoyable spiritual activities have caused changes in the mood and behavior. Since the efficiency and acceptance of any type of psychotherapy depend on the adjustment of its content with cultural backgrounds and values of the people, spirituality integrated psychotherapy (SIPT) is more suitable for Muslims and these people will be better candidates for such a therapy. On the other hand, effectiveness of spirituality integrated psychotherapy (SIPT) and its relative preference over biological and cognitive-behavioral therapies result from the nature of dysthymic disorder and multi-component nature of spirituality integrated psychotherapy. Dysthymic disorder has turned into an established lifestyle due to its chronic nature and this therapy tries to change life quality by targeting at cognitive, emotional, behavioral and spiritual components. The present authors agree with Peterson and Seligman  that spirituality and religion with the mechanisms and interfaces such as the effect on personal coping processes, problem solving skill, increase of self-esteem, hope, sincerity, control, comfort, emotional support, spiritual support and integrated (monotheistic) interpretation of the world, are effective on the individual solidarity and well-being and increase intra-psychological abilities to change lifestyle. The results of this randomized clinical trial revealed that because of their religious background, in Iranian patents with dysthymic disorder spiritually augmented psychotherapy is more effective than medication and cognitive behavioral therapy to modify dysfunctional attitudes. However, there is not difference between SIPT and CBT to reduce severity of depressive symptoms. One of the limitations of this study was its short follow-up period (three months) and it is necessary to have a longer follow-up period in future studies. The second limitation was about the effectiveness index of test scores and statistical differences. It is suggested for future studies to include percentage of the improved patients and clinical significance as the criteria. Another limitation was that medical intervention of this study which was compared with other methods was not a specified medicine with definite dosage but the medicines were those prescribed by the psychiatrist but on the basis of the standard protocol. Authors are thankful to staff of Noor and Alzahra Medical Centers, dormitories and faculties of Isfahan University of Medical Sciences and Isfahan Goldis Psychological Services Center for helping in processing of this research. 1. McFarland BR, Klein DN. Mental health service use by patients with dysthymic disorder: Treatment use and dropout in a 7 1/2-year naturalistic follow-up study. Compr Psychiatry 2005;46:246-53. 2. Avrichir BS, Elkis H. Prevalence and underrecognition of dysthymia among psychiatric outpatients in São Paulo, Brazil. J Affect Disord 2002;69:193-9. 3. Bell B, Chalklin L, Mills M, Browne G, Steiner M, Roberts J, et al. Burden of dysthymia and comorbid illness in adults in a Canadian primary care setting: High rates of psychiatric illness in the offspring. J Affect Disord 2004;78:73-80. 4. Markowitz JC. Psychotherapy for dysthymic disorder. Psychiatr Clin North Am 1996;19:133-49. 5. Almeida AM, Lotufo Neto F. Cognitive-behavioral therapy in prevention of depression relapses and recurrences: A review. Rev Bras Psiquiatr 2003;25:239-44. 6. Wampold BE, Minami T, Baskin TW, Callen Tierney S. A meta-(re) analysis of the effects of cognitive therapy versus'other therapies' for depression. J Affect Disord 2002;68:159-65. 7. Haby MM, Donnelly M, Corry J, Vos T. Cognitive behavioural therapy for depression, panic disorder and generalized anxiety disorder: A meta-regression of factors that may predict outcome. Aust N Z J Psychiatry 2006;40:9-19. 8. Feldman G. Cognitive and behavioral therapies for depression: Overview, new directions, and practical recommendations for dissemination. Psychiatr Clin North Am 2007;30:39-50. 9. Propst LR, Ostrom R, Watkins P, Dean T, Mashburn D. Comparative efficacy of religious and nonreligious cognitive-behavioral therapy for the treatment of clinical depression in religious individuals. J Consult Clin Psychol 1992;60:94-103. 10. Post BC, Wade NG. Religion and spirituality in psychotherapy: A practice-friendly review of research. J Clin Psychol 2009;65:131-46. 11. Hofmann SG. The Importance of Culture in Cognitive and Behavioral Practice. Cogn Behav Pract 2006;13:243-5. 12. D'Souza RF, Rodrigo A. Spiritually augmented cognitive behavioural therapy. Australas Psychiatry 2004;12:148-52. 13. Smith TB, Bartz J, Richards PS. Outcomes of religious and spiritual adaptations to psychotherapy: A meta-analytic review. Psychother Res 2007;17:643-55. 14. Pargament KI. Spiritually integrated psychotherapy: Understanding and addressing the Sacred. New York: Guilford Press; 2007. 15. Aten JD, Worthington EL Jr. Next steps for clinicians in religious and spiritual therapy: An endpiece. J Clin Psychol 2009;65:224-9. 16. Cole BS. The integration of spirituality and psychotherapy for people confronting cancer: An Outcome Study. USA: Bowling Green State University; 1999. 17. Berry D. Does religious psychotherapy improve anxiety and depression in religious adults? A review of randomized controlled studies. Int J Psychiatr Nurs Res 2002;8:875-90. 18. Razali SM, Hasanah CI, Aminah K, Subramaniam M. Religious-sociocultural psychotherapy in patients with anxiety and depression. Aust N Z J Psychiatry 1998;32:867-72. 19. Azhar MZ, Varma SL. Religious psychotherapy in depressive patients. Psychother Psychosom 1995;63:165-8. 20. Azhar MZ, Varma SL, Dharap AS. Religious psychotherapy in anxiety disorder patients. Acta Psychiatr Scand 1994;90:1-3. 21. Townsend M, Kladder V, Ayele H, Mulligan T. Systematic review of clinical trials examining the effects of religion on health. South Med J 2002;95:1429-34. 22. First MB, Spitzer RL, Gibbon M, Williams J B. Structured Clinical Interview for DSM-IV-TR Axis I Disorders, Research Version, Patient ed. (SCID-I/P) New York: Biometrics Research, New York State Psychiatric Institute; 2002. 23. Helen J, Streubert S, Carpenter S. Qualitative research in nursing. USA: William and Wilkins; 2007. 24. Kaplan HJ, Sadock BY. Comprehensive textbook of Psychiatry. Philadelphia: William and Wilkins; 2005. 25. Moore RG, Garlund A. Cognitive therapy for chronic and persistent depression. UK: Wiley Press; 2003. 26. Steer RA, Clark DA, Beck AT, Ranieri WF. Common and specific dimensions of self-reported anxiety and depression: A replication. J Abnorm Psychol 1995;104:542-5. 27. Oliver JM, Morphy SL, Ferland DR, Ross MJ. Contribution of the cognitive style Questionnaire and Dysfunctional Attitude Scale to measuring cognitive vulnerability to depression. Cognit Ther Res 2007;31:51-69. 28. Ebrahimi A, Mousavi SGH. Development and validation of the Dysfunctional Attitude Scale -26 items: Factor structure, reliability and validity in Iranian Psychiatric outpatients. Istanbul, Turkey: Paper presented at the 7th International Congress of Cognitive Psychotherapy; 2011. 29. Vaccaro B. Spirituality in the treatment of a man with anxiety and depression. South Med J 2007;100:626-7. 30. Avants SK, Beitel M, Margolin A. Making the shift from 'addict self' to 'spiritual self': Results from a stage 1 study of spiritual self-schema (3-S) therapy for the treatment of addiction and HIV risk behavior. Ment Health Relig Cult 2005;8:167-77. 31. Richards PS, Berrett ME, Hardman RK, Eggett DL. Comparative efficacy of spirituality, cognitive, and emotional support groups for treating eating disorder inpatients. Eat Disord 2006;14:401-15. 32. Peterson C, Seligman ME. Character strengths and virtues. Oxford: Oxford university press; 2004. 33. Cole B, Pargament K. Re-creating your life: A spiritual/psychotherapeutic intervention for people diagnosed with cancer. Psychooncology 1999;8:395-407. 34. Azhar MZ, Varma SL. Religious psychotherapy as management of bereavement. Acta Psychiatr Scand 1995;91:233-5. 35. Bartoli E. Religious and spiritual issues in psychotherapy practice: Training the trainer. Psychotherapy (Chic) 2007;44:54-65. 36. Chen TH, Lu RB, Chang AJ, Chu DM, Chou KR. The evaluation of cognitive-behavioral group therapy on patient depression and self-esteem. Arch Psychiatr Nurs 2006;20:3-11. 37. Silva de Lima M, Hotopf M. Pharmacotherapy for dysthymia. Cochrane Database Syst Rev 2007;2:CD004047. 38. Ebn Abi Alhadid. Nahgolbalagheh Description. A Research Done by Mohammad Ebrahim 1387 AH, Beirut, Darolehya. Available from: http://www.al-islam.org/nahjul/commentaries.htm. [Last accessed on 2011 Oct 21]. 39. Majlesi MB. Baharolanvar, Alahadith Noor Comprehensive Software, Qom, 1996: Computer Research Center of Islamic Sciences. Available from: http://www.the-hadith-software.en.softonic.com. [Last accessed on 2011 Jan 10].